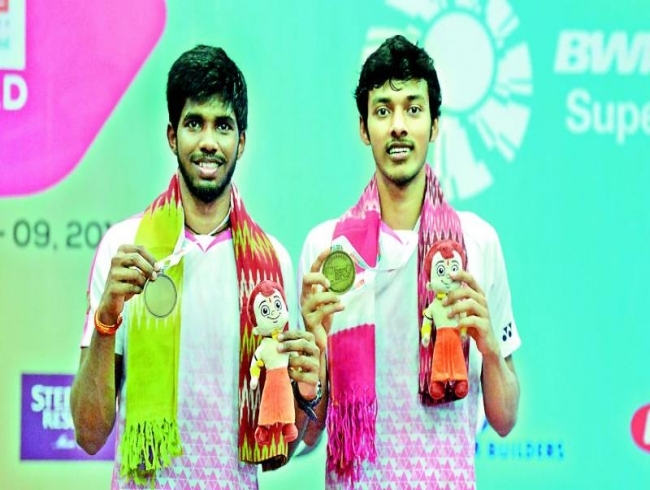 Hyderabad: India’s Sameer Verma in the men’s singles while the pair Satwiksairaj Rankireddy and Chirag Shetty continued their fine performances to win their respective finals and emerge champions in the BWF Tour Super 100 tournament here on Sunday. In the men’s singles final, top seed Verma defeated Malaysia’s Soong Joo Ven in straight games as the scoreline displayed 21-15, 21-18. Meanwhile the men’s double pair of Rankireddy and Shetty also came out victorious after they comfortably defeated the third seeded Indonesian pair of Akbar Bintang Cahyono and Moh Reza Pahlevi Isfahani by a 21-16 21-14 verdict to lift the trophy. It could have been third title for the Indian players but in the mixed doubles final, the top seeded local pair of Pranaav Jerry Chopra and N. Sikki Reddy had to face disappointment as they finished second best after losing the final. Chopra and Reddy toiled for 55 minutes before going down 15-21, 21-19, 25-23 against Akbar Bintang Cahyono and Winny Oktavina Kandow. Men’s singles final: Sameer Verma (Ind, 1) bt Soong Joo Ven (Malaysia) 21-15, 21-18. Women's singles final: Kim Ga Eun (Kor) bt Deng Joy Xuan (Hkg, 4) 21-9, 18-21, 21-17. Mixed doubles final: A. Cahyono/ W. Kandow (Ina, 6) bt Pranaav Jerry Chopra/ N. Sikki Reddy (Ind, 1) 15-21, 21-19,25-23. Men’s doubles final: Satwiksairaj Rankireddy/ Chirag Shetty (Ind, 1) bt Akbar Bintang Cayhono/ Moh Reza Pahlevi Isafahani (INA, 3) 21-16, 21-14. Women’s doubles final: NG Tsz Yau/ Yuen Sin Ying (HKG, 5) bt Vivian Hoo/ Yap Cheng Wen (MAS) 21-18, 16-21, 21-14.